Charles Price was appointed by Governor Robert Bentley and confirmed by the Alabama Senate on February 11, 2016 to serve a term on the Alabama Ethics Commission that began on September 1, 2015 and ends on August 31, 2020. Price, a native Montgomerian, is a Retired Presiding Judge having served thirty one years in the Fifteenth Judicial Circuit of Montgomery County, Alabama. He is a graduate of Carver High School in Montgomery, Alabama, Virginia Union University in Richmond Virginia, and the George Washington University School of Law in Washington, D.C. He has a plethora of legal experiences, including: The United States Department of Justice, Municipal Judge – Montgomery, Alabama, Assistance Attorney General for the State of Alabama, Acting District Attorney in Escambia County, and Deputy District Attorney in Montgomery County. 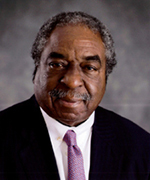 Judge Price has received numerous honors including: John F. Kennedy Profile in Courage Award, Dr. Martin Luther King, Jr. Humanitarian Award, and Attorney Johnnie Cochran Soaring Eagle Award. In 2009, the Montgomery County Court House was renamed Montgomery County Court House, Phelps-Price Justice Center in memory of Judge Phelps and in honor of Judge Price..